Laura Sharp Wilson’s studio reveals the many influences that inform her work — the room in her basement in Salt Lake City s brimming with books that include botanical drawings, Asian art, outsider art, calligraphy, cartooning, abstract art, and Soviet art posters, so it’s no wonder her canvas seems barely able to contain her work. Though she claims the books are for weighing down her paintings (which she paints on mulberry paper and mounts on wood), she admits that she’s interested in them all. The studio also contains the many projects she’s working on simultaneously, including drawings for an installation, a new painting, various collages and some old paintings recently returned from her gallery in New York City. 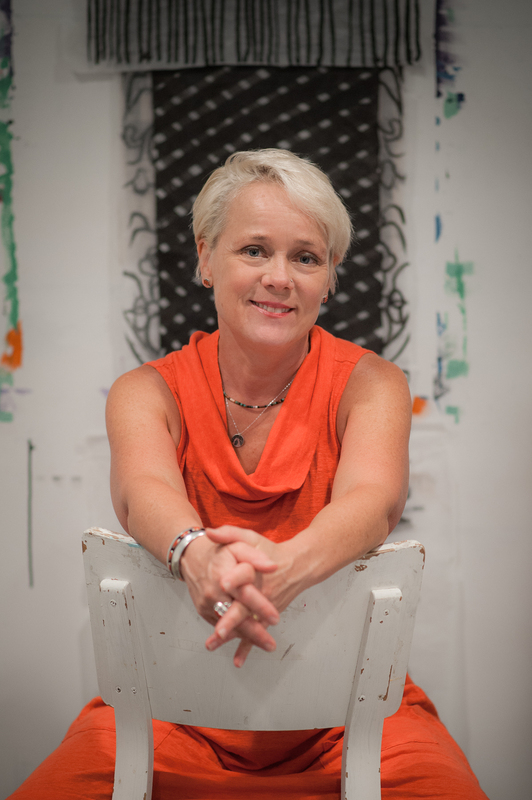 Though most people familiar with Wilson probably think of her as a painter, her body of work, and a new show at Finch Lane Gallery, reveal that she is adept in many media. When she was young, Wilson lived in New York City, while her mother studied for a master’s degree in modern dance choreography, so the world of dance and costume design became one of the backdrops for her artistic development. She remembers looking at the SoHo News, with its photos of club culture, creative people with signature styles that defined them, using fabric, makeup, and design, and thinking, “I want to make something fabulous.” The innovation and experimentation of that time period created an impetus for Wilson’s own work. As a child, she worked in both fine art mediums, like drawing and painting, and with art forms that were considered crafts, like sewing and embroidery. She admits she didn’t have the patience for learning from someone else, saying, “I’m pretty determined.” She taught herself by experimenting and learning from her mistakes. 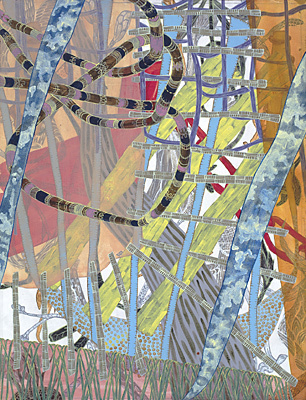 This sense of experimentation defines the evolution of her work. Her mother often took her to dance performances, from modern dance to the ballet. 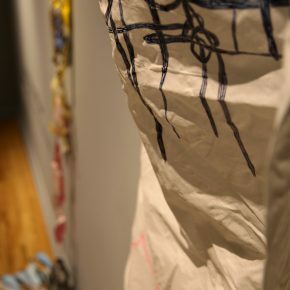 She became fascinated by the costumes, beautifully constructed sewn objects made by artists. “I was always really into the costumes,” she recalls. “The costumes were amazing. They were made by master costume makers and were made to be worn when someone was moving.” She was so taken by the world of dance and costumes that when she attended Carnegie Mellon University in Pittsburgh, she initially thought she might study costume design with the theater department. 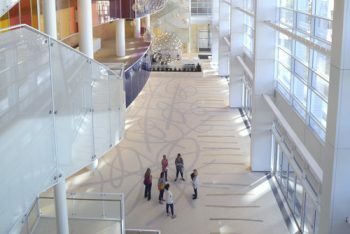 She had always worked with textiles, but working with design added another element to her repertoire. 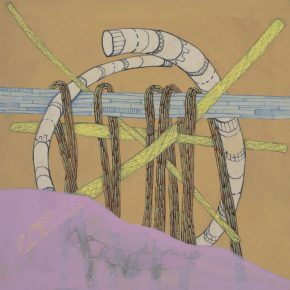 “It added another layer of sophistication.” Bringing painting and textile design together was exciting, and pointed her work in a new direction, revealing itself in the kind of one-dimensional plane of her canvases, which appear as a decorative surface, yet imply more depth than purely decorative design. Viewing Laura Sharp Wilson’s paintings can feel like entering a dream, where the imagery feels simultaneously logical and overwhelming. 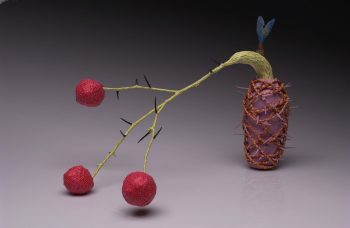 Her canvases teem with textures that are manufactured and organic: roots, stalks, fabric, yarn, chains, and jewels. The different elements appear not so much woven together as layered, gathered together in a dense visual field. As a viewer, you can feel that you are reveling in an aesthetic celebration and being pulled in by the seemingly animated vines that fill the frame. The botanical elements are really where she began. Wilson’s early paintings were mostly of flowers or plants, and those helped her to gain some praise as a painter. Since moving to Utah in 2009, her work has responded to her new environment, and her characteristically dense work has taken on a sparser, desert-influenced palette and sense of space. This may be most evident in her best-known work, the design for the floor for the new Eccles Performing Arts Center in downtown Salt Lake City. 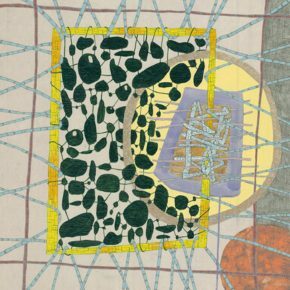 It incorporates a familiar element from her paintings — a long, thin strip that could be fabric or could be a reed, snakes its way across the floor, circling in on itself — but the lone element on a broad expanse is a shift from her more densely adorned paintings. Wilson concedes that because they are commodities people want to buy, paintings sometimes limit an artist’s self-expression. 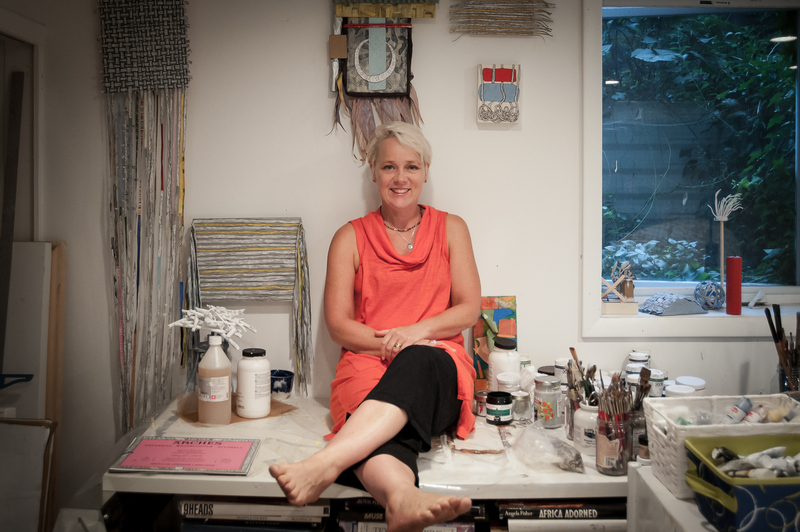 Working in other forms, like installation and papier–mâché, allows her a freedom to use her crafty side. 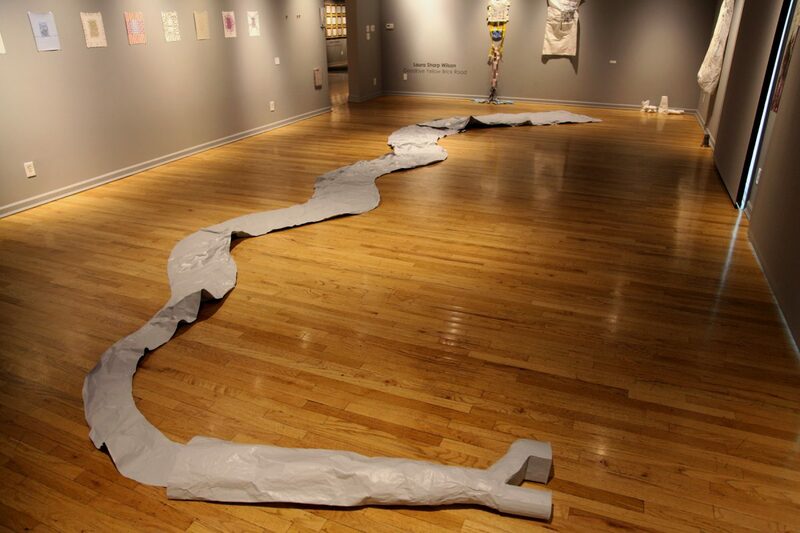 When she completed her MFA at the University of North Carolina at Chapel Hill, her final show was a series of sculptures arranged as an installation. 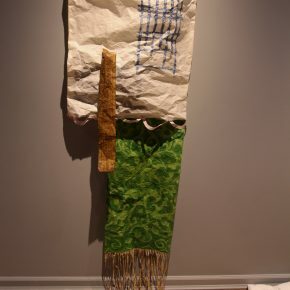 She describes these sculptures as “sewn figures” which were bound and stuffed, revealing that, even with sculpture, she was combining textiles with density. Her newest work, which fills one room of Finch Lane Gallery, draws on her experience with sculpture, but combines three-dimensional forms with drawings and paintings. 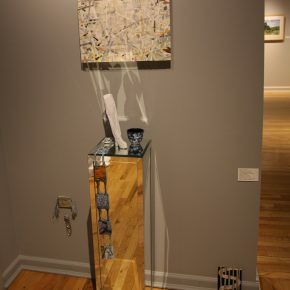 The exhibit, entitled Goodbye Yellow Brick Road, after Elton John’s 1973 album, draws on the artists of the ‘70s and their influence on her creative development. The installation makes use of, as the title implies, a road (though not yellow nor brick), platform boots, a mirrored altarpiece and numerous traditional drawings and paintings in her iconic style, as well as ones that extend three-dimensionally beyond her normal surfaces. An idea that she returns to again and again is the tension between transparency and obfuscation. Her paintings foreground and subvert this obsession by utilizing both a density that implies depth and a flat decorative surface that makes use of the aesthetics of design. Her new work continues to interrogate these ideas by using transparent surfaces and designs that seek to reveal and to hide. Currently, she’s integrating pieces of old paintings and drawings into colorful collages that she says she doesn’t know what to do with. 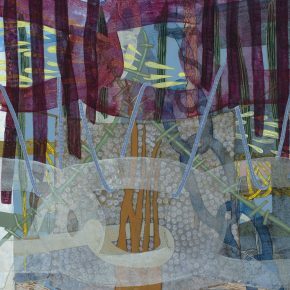 Like her paintings, these collages are dense and colorful, inviting the viewer to once again meditate on the question of what is being covered up and what’s being left out. Goodbye Yellow Brick Road is at Finch Lane Gallery through September 22. You can view more of Laura Sharp Wilson’s work on her Facebook page. Lynn Kilpatrick’s first collection of short stories, In the House, was published by FC2. Her fiction has recently appeared in Alfred Hitchcock Mystery Magazine, and Hotel Amerika. Her essays have been published in Creative Nonfiction, Ninth Letter, and Brevity. She earned her PhD in Fiction from the University of Utah and an MA in Poetry from Western Washington University. She teaches at Salt Lake Community College.